SEG - Since 1979... Bringing Service Down to Earth. Broadband Services are out there in thin air. How to get them transmitted down to earth is where Satellite Engineering Group comes in. 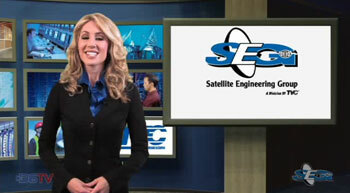 As a leading service provider and supplier to the CATV, broadcast, & satellite marketplace, SEG, a division of TVC Communications, provides design and engineering for the integration, installation and maintenance of Satellite and Headend Networks. In addition to our staff of in-house sales & product experts, project engineers and professional customer service representatives, SEG has a network of over 550+ sub- for large scale communication rollouts, upgrades and maintenance services. With state of the art software and an infrastructure that allows for real time reporting, SEG provides turn-key services that other providers simply do not have the capability to supply.